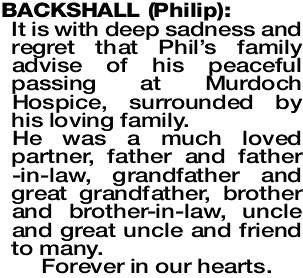 It is with deep sadness and regret that Phil's family advise of his peaceful passing at Murdoch Hospice, surrounded by his loving family. He was a much loved partner, father and father -in-law, grandfather and great grandfather, brother and brother-in-law, uncle and great uncle and friend to many. A Service to celebrate the life of the late Mr Philip Backshall of Mount Pleasant will be held in the Crematorium Chapel of FREMANTLE Cemetery, WEDNESDAY (17.04.2019) at 2.00pm. No flowers by request. Donations in lieu to the Cancer Foundation would be appreciated. 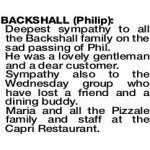 Farewell My Darling Phil. You were so brave and never once complained. You weren't just my father, you were also my best friend. You were always there with a ready smile and hug. I loved and will always cherish our many catch ups and chats, sharing a beer or red wine and many, many laughs. 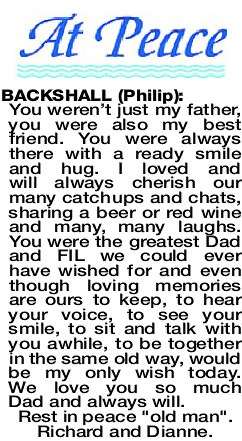 You were the greatest Dad and FIL we could ever have wished for and even though loving memories are ours to keep, to hear your voice, to see your smile, to sit and talk with you awhile, to be together in the same old way, would be my only wish today. We love you so much Dad and always will. Rest in peace "old man". Richard and Dianne. 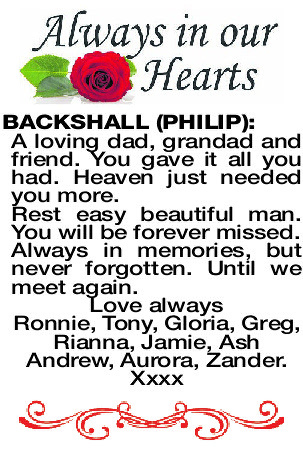 BACKSHALL PHIL Beloved and loving dad of Jason, Scott (dec) and Samantha, father-in-law to Natalie and future father-in-law to Charles, Grandpa of Amelia, Riley and Baby B, friend of Jan. At peace now, we love you with all our hearts. BACKSHALL PHIL Sincere condolences to Phil's family at this sad time. Our thoughts and prayers are with you. Passed away peacefully of 4.4.2019. 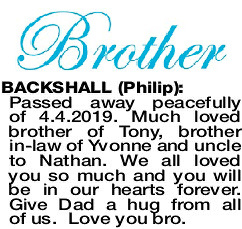 Much loved brother of Tony, brother in-law of Yvonne and uncle to Nathan. We all loved you so much and you will be in our hearts forever. Give Dad a hug from all of us. Love you bro. With deepest sadness I say goodbye to my eldest Brother Phil. He is the man I have looked up to, respected and admired all of my life. Rest Easy PAB. Ross Dearly loved Brother- in-law of Carrol. Adored Uncle of Amanda and Shane and Michelle and Mark. Fun loving Great-Uncle of Joshua, Jordan and Jonah. BACKSHALL PHILIP A loving dad, grandad and friend. You gave it all you had. Heaven just needed you more. Rest easy beautiful man. You will be forever missed. Always in memories, but never forgotten. Until we meet again. I was blessed to have had you in my life Phil. 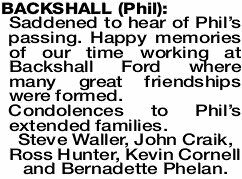 Sincere condolences to Ross, Carrol and extended Backshall families on your sad loss. Fond memories of years growing up together. BACKSHALL PHIL You were there for our wedding, the birth of our son, and so long for our Mother, Beverley, as her loving partner. You have had an enormous and everlasting impact on our family, and for that we will always be grateful. Joel, Jin and Felix. 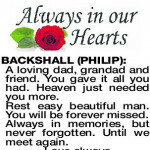 BACKSHALL PHILIP Very sad at Phil's passing. Condolences to all family and Bev. A true mate who will be missed by all. Such a privilege to have known him. Sympathy to all families. Rest in Peace. 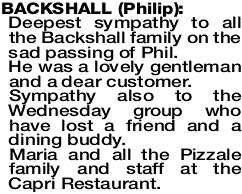 Saddened to hear of Phil's passing. Happy memories of our time working at Backshall Ford where many great friendships were formed. 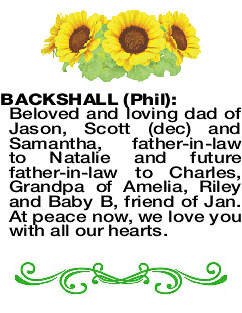 Condolences to Phil's extended families. Steve Waller, John Craik, Ross Hunter, Kevin Cornell and Bernadette Phelan. Sad to hear of Phil's passing. Sympathy to all family. He was a good bloke. Mal and Kay Brown and family. Cheers Fatty. 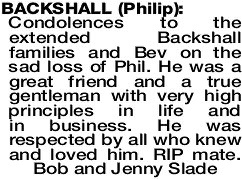 BACKSHALL PHILIP So sad at Phil's passing. Lunches will never be the same. Condolences to Bev and his family. RIP Backy. Phil, you will be sadly missed by all who have had the privilege to know you. We will remember you as a sincere, caring, gentleman and friend who enjoyed a good red. 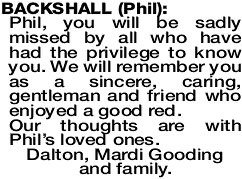 Our thoughts are with Phil's loved ones. Dalton, Mardi Gooding and family. BACKSHALL PHILIP Deepest sympathy to Phil's family, loved ones and to his countless close friends. Backy was one of life's treasures, and he will always be 'part of the town'. Best wishes Murray Martin and family. 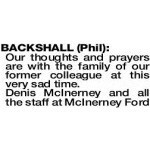 BACKSHALL PHIL Our thoughts and prayers are with the family of our former colleague at this very sad time. Sad to lose a very close and long time friend. He will be missed by all. 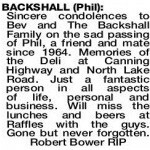 Our sympathy to Bev and Phil's family. Adrienne and Brian. Deepest sympathy to all the Backshall families on the sad passing of Phil, fond memories of an old mate who was a part of Fremantle. John, Jane and Stephen Covich. Sad to hear of your passing. Say hello to Karen ("Iron Lady"). Deepest sympathy to all the Backshall family on the sad passing of Phil. He was a lovely gentleman and a dear customer. Sympathy also to the Wednesday group who have lost a friend and a dining buddy. Maria and all the Pizzale family and staff at the Capri Restaurant. 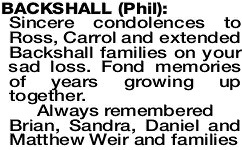 Amanda, Michelle and all the family on the sad passing of Phil. BACKSHALL PHIL A wonderful man we were proud to call our friend. 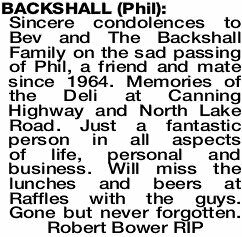 Our love and thoughts are with our darling Beverley, her family and all of Phil's children and family.